You deserve a smile that makes you feel good about yourself. You want a smile that displays your confidence, health and inner beauty to the world. Our West Hollywood dentist can help you achieve that smile. We offer extensive dental solutions for virtually every patient and every budget. We begin with routine dental care. The right cleaning and checkup schedule can get you back on the track to good dental health. We provide you with timely information about at-home care that helps you maintain better dental hygiene and reduces your risk of dental disease. When necessary, our California Dental Network HMO dental insurance dentist in West Hollywood recommends treatments and procedures that can improve oral function or restore dental health. Periodontal treatments can be used to combat and control periodontal disease while dental implants can restore missing teeth. Orthodontics may be recommended to straighten teeth, reduce your risk of future dental disease and improve the appearance of your smile. We even offer cosmetic treatments that include Invisalign, porcelain veneers, teeth whitening treatments, Lumineers, inlays, onlays, tooth-colored fillings and dental bonding. Our West Hollywood California Dental Network HMO dental insurance provider will explore all your treatment options with you and answer all your questions so that you can be confident about the choices you make for your smile. If you experience dental anxiety that interferes with your ability to seek or obtain dental care, we may recommend oral or inhaled sedation, which can improve your comfort and relaxation throughout your visit with us. 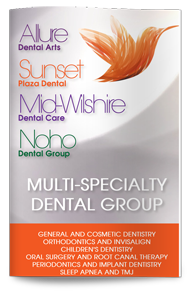 At Sunset Plaza Dental, we are committed to your smile and your dental health, and our entire team works together to create your dental plan and put it into practice. Contact our offices today to learn more or to schedule your next appointment.